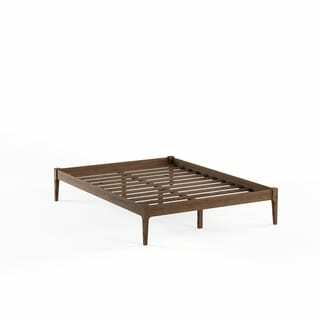 This walnut finished mid century low rise bed can embellish any home or studio. Constructed of eco-friendly solid rubberwood and poplar, the Damon is built to last.Tapered legs lend sophisticated style to the bedroom. The Damon platform style bed frame enables you to lift the height of your mattress in a economical way. The 15' high platform bed height is perfect for any bed mattress/futon mattress (no box-spring needed). 10.5 Inch under-bed clearance provides ample storage space. Simple, Solid yet Stylish, the Damon is made in Malaysia and it requires assembly.